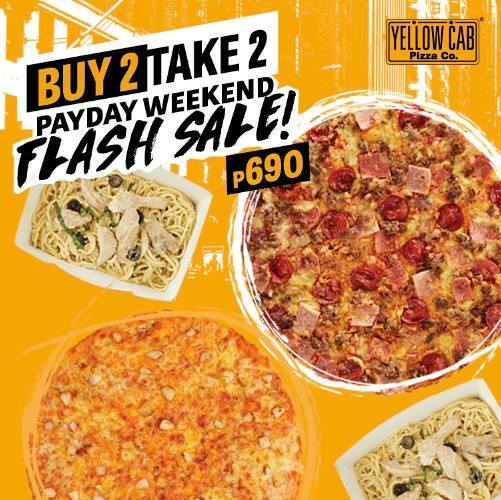 It's Yellow Cab's Payday Weekend FLASH SALE! Treat yourself and fuel up with Yellow Cab's Buy 2 Take 2 Promo! Buy (1) Regular 10” Manhattan Meatlovers Pizza and 1 Full Chicken Alfredo Pasta and get FREE 1 Regular 10” Gilroy Garlic Pizza and 1 Full Chicken Alfredo Pasta for P690. Promo runs from April 13-17, 2018, and available for dine in, take out, and delivery. Call ‎‎‎789-9999, or check delivery.yellowcabpizza.com or visit your favorite Yellow Cab branch!